Dr. Francis Ole Kaparo, the former Speaker of the National assembly of Kenya, is the Chairperson, National Cohesion and Integration Commission (NCIC). Siddharth Chatterjee, (@sidchat1) is the United Nations Resident Coordinator a.i and the United Nations Population Fund (UNFPA) Representative to Kenya. NAIROBI, Kenya, Jun 14 2016 (IPS) - Kenyans, and friends of Kenya, are once again hoping that the five-yearly ritual of elections will not take the form of widespread ethnic violence and destruction of property. However, recent intransigent positions over the Independent Electoral and Boundaries Commission (IEBC) are a cause for apprehension and concern. The social and economic effects of the 2007 election dispute are still being felt, and key sectors of the economy, including tourism, are still struggling. The violence had also left its scar on the survivors in the form of anxiety and post-traumatic stress. Statistics on sexual and gender-based violence show that whenever election-related violent conflict occurs, it is the innocent women and children who suffer most. As a development partner of Kenya, and guided by the core values of respect for human rights, diversity, equality and inclusion, the United Nations (UN) family is determined to do all it can to help prevent a recurrence of violence and conflict. The UN in Kenya is currently supporting institutions to deliver a free, fair and peaceful election, with an eye on the welfare of the most vulnerable populations. It recognizes the adverse effects of violence on the poor, especially women and children, and believes that respect for human rights and fundamental freedoms, including the right to peacefully assemble, is critical to fostering democracy and dialogue. Through the current electoral support project entitled Strengthening Electoral Processes in Kenya (SEPK), supported by the European Union (EU), the Department for International Development (DFID) of the United Kingdom and the United States Agency for International Development (USAID), the UN is supporting institutional strengthening, professional development, procurement and the use of information and communication technology for the 2017 elections. The UN is also working with various stakeholders such as the National Cohesion and Integration Commission (NCIC), faith-based organizations, and civil society groups towards peace building, conflict prevention, and on early-warning and response mechanisms. These investments will only yield fruit if there is a genuine desire to carry out a peaceful election. For those seeking elective office, the elections must not be a zero-sum game, and the welfare of the country must supersede individual gain. Kenyans must start believing that elections do not mean destroying every gain made over the previous five years, and that political contestation is possible without violence. The youth must decide to carve out a better future for themselves and say no to politicians who misuse their energy and enthusiasm. 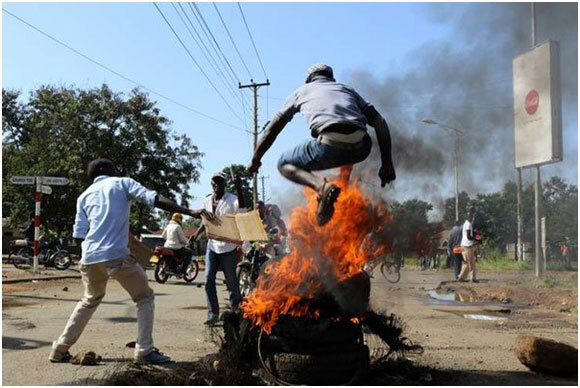 It must not be lost on them that the heaviest toll from election violence is always on the poor youth, most of whom are already affected by lack of opportunities and have little hope of coming out of poverty. These young populations provide a demographic edge for economic prosperity, but they are also a powder keg, especially when political self-interests clash, that ignites violence and lawlessness. Today, there is no greater need than that of investing in their future in order to stay the country from degenerating into chaos whenever elections approach. Kenya has made significant of strides in attracting foreign direct investment. For instance, the Tenth World Trade Organization Ministerial Conference that was held in Kenya last year cemented Kenya’s global significance and reinforced the belief that Kenya is open for business. However, a politically charged and polarized environment does not bode well for a conducive environment that attracts new investors, while at the same encouraging the old ones to stay put. With Kenya hosting several high-level meetings in the coming months; such as the United Nations Conference on Trade and Development (UNCTAD) on 17-22 July 2016; Tokyo International Conference on African Development (TICAD) on 27-28 August 2016 – the first time the conference is being held outside Japan – and the Global Partnership for Effective Development Co-operation (GPEDC) 28 November – 1 December 2016; the political violence will not help the country’s image – that of a stable destination that attracts tourists and investors. Kenya must continue to gain the confidence of the international community by demonstrating that it can handle the demands of democratic space. Efforts that are being made to ensure that Kenya has a peaceful, credible, free and fair election, such as the recent formation of the parliamentary joint select committee to unlock the IEBC impasse, are a welcome step. The work being done by the National Cohesion and Integration Commission (NCIC) to ensure a peaceful, harmonious and integrated society should be supported by all. While ultimately it is the people of Kenya who will chart the course that the country takes through the institutions they have put in place, the UN will continue to remind the leaders of sides of the political spectrum of Kenya, of their obligation to the poor and vulnerable. As the official election campaign period approaches, we must choose the dove of fraternity and mutual concession over the hawk of belligerence and mutually destruction.